As one of few fellowship trained breast imagers in northeast Wisconsin, Dr. Sung provides valuable expertise in the areas of women’s imaging, in all facets of breast imaging including mammography, breast ultrasound and MRI, and aspiration/biopsy procedures. She is also a valuable asset in the areas of obstetrical and gynecologic ultrasound. Dr. 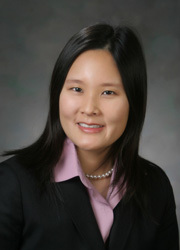 Sung joined Radiology Associates in 2008. Dr. Sung earned her medical degree at the University of Chicago, Pritzker School of Medicine. She completed a transitional year internship at Christiana Care Hospital in Newark, DE, and Residency in Diagnostic Radiology at Thomas Jefferson University Hospital in Philadelphia. She then returned to the University of Chicago, obtaining additional fellowship training in breast imaging. She joined Radiology Associates in 2008. Dr. Sung is certified by the American Board of Radiology, and is a member of the Radiological Society of North America, the American College of Radiology and the American Roentgen Ray Society.